giving shape to information space - >> mind the __ GAP* ? 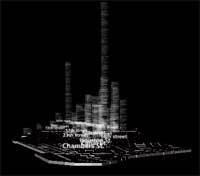 Considering the invisble net of data which influences the constructions of perceptible areas of each of us, searchscapes, a work by Juliana Sato Yamashita, tries to establish a tridimensional map of Manhatten relying on data obtained through the web. The objective is to compare representations of the city’s “physical spaces” and “information spaces”. Taking the metaphor very literally, a specific address is searched on Google (ex: “1 Broadway” + “New York, NY”). Such a search will bring mostly results that correspond to this specific location. The total number of text results is parsed and then plotted on a map of the physical space. The height of the “building” on that location will correspond to the number of results found. More results will correspond to higher “information buildings”. This is an attempt to materialize information: to give it dimension, physicality. Contemporary architecture seems to be driving in the opposite direction: becoming more mediated, more ephemeral, “bodiless”. This project is an attempt to give “shape” to the data that we find on the Internet, but not “quantify”.